GE's power segment was the company's main source of disappointment in 2017, and its troubles may not be over for a while yet. It's hard to understate the importance of General Electric Co.'s (NYSE:GE) power segment for investors. It's long been the company's core business, and given that CEO John Flannery's plans are to focus GE on power, healthcare, and aviation, it's clear his ability to return the ailing segment to form will be a key factor in any investment thesis around the stock. GE may well get power back on track, but if so, it's still going to take time, and it might not be as easy as many people think. Here's what you need to know. A General Electric Company gas turbine in production. Image source: General Electric Company website. First, the outlook and commentary from GE's investor update provides cause for concern. Flannery was candid in declaring that the energy assets it acquired from Alstom have "clearly performed below our expectation." Part of the problem was a downturn in demand for gas turbines -- hard to blame GE for that -- but equally worrying was Flannery's recognition that the acquired assets were "hurt by a very extended closing process and a lot of losses that were in some of the project businesses, especially in the renewable and some of the grid pieces." In addition, management's guidance for power segment is uninspiring and suggests can't expect meaningful improvement in the power segment for a couple of years.
" Power stabilizes, services flow, equipment flat"
The key questions regarding GE power business relate to one issue: whether its problems are cyclical or structural. For example, is demand for its gas turbines and power services merely experiencing a temporary period of weakness, or are the sales declines reflective of a long-term structural shift? This is an important point because the gist of GE's plan for power involves executing better. The company believes it can rely on self-help initiatives to improve performance. However, there are two problems with this thesis. Management's commentary on end markets was underwhelming, and it's far from clear that the problem isn't structural. While one source of trouble for GE power 2017 involved issues of execution, it was also dragged down by a failure to react effectively to what former CFO Jeff Bornstein described as a shift in the structure of the services market. The bullish case sees GE's problems as being cyclical and weakness in current demand coming from relatively higher gas prices and economic weakness in some parts of the world -- notably the Middle East, where GE has had problems closing deal this year. The thesis is that these issues will dissipate in time. Let's look at this case, starting with the U.S. Energy Information Administration's (EIA) short-term energy outlook, which calls for the share of U.S. electricity generated from natural gas to fall to 32.4% in 2018 from 34% in 2016, driven by "higher natural gas prices and increased generation from renewables and coal." Optimists will look at the chart below and conclude that 2016-2018 is merely a blip caused by a bounce in gas prices, and posit that the long-term trends of falling coal utilization and rising natural gas use are still in place -- good news for GE's gas turbine demand. Data source: EIA. Thousand megawatt hours per day. Renewables excludes hydropower. 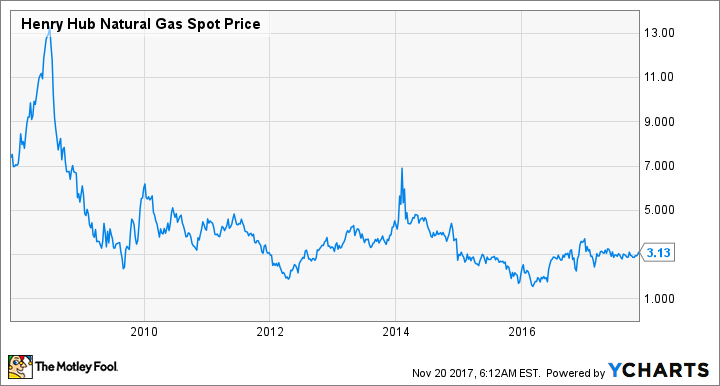 Here's how natural gas prices have bounced since 2016, but as you can see, they are still well below historical norms -- and low prices induce utilities to use natural gas to generate electricity. On the other hand, observant readers will note the rapid rise in power generated by renewable sources. In fact, the share of U.S. electricity generation from renewables (excluding hydropower) will increase from 3.1% in 2008 to 9.8% in 2018 according to EIA, and that share (including hydropower) is expected to increase from 13% in 2015 to 23% in 2025. Moreover, falling costs for energy storage and a consequent increase in usage will make renewables relatively more attractive, as one of their disadvantages has been ensuring consistency of supply. In addition, a rise in the use of storagecould reduce demand for the smaller gas turbines now often used to meet peak demand loads -- not good news for GE. These points were touched on in the investor update. For example, CEO of GE Power Russell Stokes acknowledged "the contributions that renewables is making to the overall energy mix; and we do realize that that's here to stay." He went on to declare he was "aware of the advancements that are taking place in storage to be able to support renewables and make it more dispatchable," before confirming: "I do believe that gas will continue to be a baseload option." Later on, Flannery said: "Yes, there's growth in -- rapid growth in renewables and storage. And that's clearly going to change quantumly the industry. But it's not going to do it overnight. So there's some stability. Any forecast you look at is 2%-ish kind of growth in gas power generation -- electricity from gas power." Clearly, renewables and storage are things GE is watching closely -- first, because it's a significant player in both markets, and second, -- because they threaten demand for gas turbines -- its most important product. Ultimately, GE shareholders are relying on two things. The first is that it will fix its execution problems -- largely relating to its failures to position itself for changes in its end markets. The second is that there will be a cyclical return to growth of around 2% in power generation from natural gas -- hardly inspiring even as a best-case scenario. Throw in the prospect of increased competition and pricing pressure in a market suffering from overcapacity, and it's fair to say GE's outlook is uncertain. However, what's certain is that the issues the company is facing aren't solely related to its execution. GE's problem may well turn out to be primarily structural in origin. Time will tell, because that's far from clear right now.